New mortgage disclosure rules went into effect that require lenders to provide home buyers two new forms that clearly detail their loan terms. For more than 30 years, Federal law has required lenders to provide two different disclosure forms to consumers applying for a mortgage and two different forms at or shortly before closing on the loan. Beginning October 3, 2015, these four forms were replaced by two new forms, a Loan Estimate and a Closing Disclosure. Within three days of applying for a loan, lenders are required to provide you with a Loan Estimate. 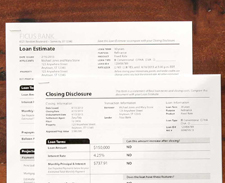 This form replaces the Good Faith Estimate and initial Truth-in-Lending disclosure. At least three business days before you close, you will also get a Closing Disclosure. It contains a summary of the final terms of your loan. This form replaces the HUD-1 Settlement Statement and final Truth-in-Lending disclosure forms for most mortgages.